“Excuse me, could you repeat that?” I asked the woman at the information desk. 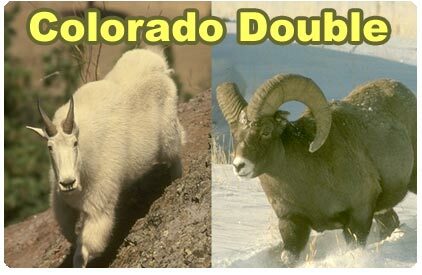 I had gone to the Colorado Division of Wildlife main office to check on the status of my Bighorn Sheep and Rocky Mountain goat applications. Another year of waiting for refund checks was unbearable. “You drew both tags.” She replied. Unbelievable! After 6 years of applying for a ram tag and 12 years for a goat, I had drawn both licenses in the same year. I was elated to say the least. How lucky can you get? I stopped at the nearest gas station to buy a Lotto ticket. It couldn’t hurt right? As I drove back to work, however, panic soon set in. How was I possibly going to get four weeks vacation from my construction job at out busiest time of year? Where was I going to find time to scout both areas thoroughly? How could I take a month away from my wife, Cody, and our son Colton born just a few months ago? I called my hunting partner, Pat Bergin, to ease my anxiety. So much for moral support, but by the time I got home that night I had a plan worked out. Since Pat and I had drawn goat permits together, we could split up scouting time. This would let me concentrate on the sheep area. Both game management areas were only an hours drive from my house in Denver so I could scout and hunt from home. This would allow more time to spend with the family. OK, this just might work. After I had the green light from my boss for the time off work I was set. I bought maps for the areas, talked to everyone I could find who had hunted my units and poured over the DOW hunter questionnaires from previous years. Pat and I also attended the Division’s orientation for sheep and goat hunters. I scouted every weekend and found some good areas and a lot of animals. I dreamt of full curl rams and snow white billy goats all summer. Before I knew it, opening day found me glassing for sheep near timberline at sunrise. I had found this ½ mile wide bowl in June and had seen some nice rams on several occasions. Today, however, only a small band of ewes showed themselves. My bother-in-law, Mark, and I picked the landscape apart with binoculars until our eyes burned. No rams. Not today. But I felt good about this area and knew that I should concentrate my efforts here. “Where?” I blurted out, trying to stay calm. “See that huge rock towards the top of the bowl? Right below that.” Pat said. I peered through my 10x42 binoculars and saw what we had come here for. Feeding slowly up the slope were five rams. We watched for as long as I could stand it and then mapped out a strategy. Pat would stay in the high rock outcropping we were hiding in and help me locate the rams with hand signals once I got closer. I checked the wind, grabbed my bow and pack and set out. After working my way around the ridge and into the timber, I realized how difficult it was going to be to find the big rock that was my landmark. I moved through the trees, straining to see into the shadows. Suddenly, a 5/8 curl ram was burning a hole through me with his stare at 70 yards. Where did he come from? I must still be 200 yards from the big rock! As he trots downhill, more sheep appear and then disappear after him. Four, five, then six rams go by. How did I blow it? I glassed Pat back up on the ridge. He was looking below me through the spotting scope. Without knowing exactly what happened, I decide to hike back up and re-evaluate. Back up top he fills me in. There was a total of 15 rams spread out in the timber. I had spooked a group of 10, but the original 5 sheep by the rock had not run. They fed downhill into the timber and vanished. The rest of the week I’m hunting alone. I promise my wife I’ll be extra careful. On the fourth day of the hunt, I spot the big ram. He and a heavy 7/8 curl are feeding in a 200 yard wide gulch with a small timbered finger down the center. I quickly take notice of his dark chocolate coat and full curl horns. What a magnificent animal. With storm clouds moving in, I know I must try a stalk now. As I make my way to within 150 yards, a light rain begins to fall. The rain quickly turns into a full blown lightning storm with heavy corn snow. The two rams head into the timber. All I can do is huddle under a large rock out cropping and wait out the storm. An hour later the storm subsides and I slowly move into the trees. Waiting for a glimpse of horn or hair, I inch forward. Suddenly sheep were running out of the timber only 40 yards in front of me! I rush to the edge of the trees just in time to see seven rams trotting single file up the opposite ridge and disappear over the top. On the long wet hike back to the truck the image of the big ram is etched into my mind. That night while I fall asleep, he’s still there haunting me and I pray for another chance. The alarm jolts me awake at 3:00 a.m.. I want to be at the top of the ridge earlier today and I make the 1 ½ mile hike as the eastern sky begins to glow. A bull elk bugles in the valley below and a moment later another answers. What an awesome day! As I approach the top of the gulch where the sheep were the day before, I slow to a crawl. With each step closer to the edge, I can see more area below. Take a step and look. One more step and there they are! Two big rams feeding down the same grassy slope as before. As I anxiously watch, they enter the timbered finger in the center of the gulch again. I climb over to the opposite side of the ridge and work my way down to just above where I think they entered. After yesterday’s fiasco, I realize it is unlikely that I will be able to put on a successful stalk in the trees without knowing their exact location. I decide to wait and see if I can ambush the rams coming out for a midmorning snack. Finding a good rock pile to sit it, I get comfortable and wait. After about 2 hours, my mind starts working overtime. What if they came out on the other side of the finger? What if they weren’t even in there anymore? I waited another hour before I had to do something. If I moved into the trees above them, maybe I could catch a glimpse of a bedded ram. I worked my way into the timber and found a large rocky out cropping where I could view both open sides of the gulch. Peering into the trees with my binoculars showed no sign of the sheep. I remembered a video I had seen where the hunter tossed a small rock into some brush to get a mule deer he had seen to show itself. What the heck! Finding a suitable stone, I toss it into the trees below. 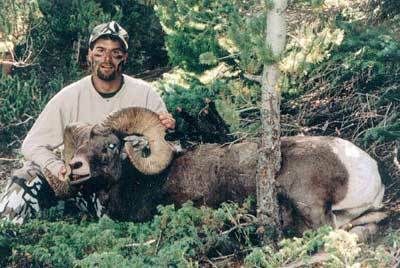 Immediately, seven rams boiled out of the timber and ran into the open 60 yards below me! They stare back into the timber wondering what had disturbed their rest. The full curl is there too. Staring. After three or four minutes five of the rams meander down the hill and out of sight. The big boy and the 7/8 curl remain. They feed for a minute or two while glancing back towards the timber. Finally they relax enough to feed up the opposite ridge and bed down at the edge of some trees. One ram watches uphill while the other surveys the slope below. Occasionally one or the other rises to feed or to get re-situated. This goes on for two hours. Although they are only 75 yards away, I am stuck. They will easily catch any move on my part to get closer. All I can do is stay hidden and wait. Finally both sheep rise and begin to feed along the slope, but their direction will keep them out of bow range. First one and then the other disappears into the trees only to reappear a minute later. I know I must do something before they are gone for good. The next time they both go into the trees, I grab my bow and pack and scamper down and across the gulch. Hunkering behind a stump, I wait. Two minutes go by and then three. Had they seen or heard me through the trees? Did I blow another chance? Suddenly they both step out 40 yards below and are heading my way! I nock an arrow while the 7/8 curl goes behind a bush. When the other rams head goes behind a tree I draw and as he steps forward I release. I watch horrified as the arrow sails low under his chest. Startled, the ram stares right through me and then looks downhill not knowing what just happened. My trembling hands nock another arrow. The big rams drops his head to the ground to resume feeding and then raises it up and looks around. The next time he drops his head, I draw my bow. As he begins to raise his head up again the arrow buries to the fletching in his chest. Both sheep bolt down the mountain and a few seconds later I hear the big ram pile up. I can’t believe what just happened. As I sit back against a tree stump, a shiver runs through my body. But I wasn’t cold. Just incredibly thrilled! As I cape and dress out the ram, I admire the heavy horns and beautiful dark coat. The 8 ½ year old sheep will later officially score 173 7/8 P&Y with 14 6/8" bases and 37 4/8" length on the long side. What a great day! Two weeks later, my legs were barely rested when it was time for Mountain Goat hunting. My partner, Pat, had some good areas scouted for us. On opening day, however, we found ourselves in a blizzard snowstorm at timberline. The grassy slopes where the goats used to be were now covered with blowing white snow. But the forecast was good and as the week went on the snow slowly melted. On the third day of our hunt, Pat arrowed a nice billy using the longbow that he had won at the Colorado Bowhunter Association’s 25th Anniversary Jamboree. With Pat needing to return to work, I was on my own for the remainder of the hunt. On the sixth day of the season, I again climbed to the top of the mountain that some goats had been frequenting. Once there, I spotted three goats working the ridge line 500 yards below. I found a small group of rocks to hide in and watched their movement. Their course was going to bring them very near my position. The trio fed closer and closer. I nocked an arrow as they closed the distance. When the goats passed me at 20 yards, I drew on the last goat and released. The arrow hit it’s mark passing completely through the vitals. All three goats ran for the top of the ridge. I had another arrow ready as they paused before heading down into the cliffs on the other side. I hit the goat again behind the shoulder. To my horror, the goat jumped over the edge into an avalanche chute and tumbled some 200 yards down. It took me 30 minutes to negotiate the snow slide down to my prize. The four year old nanny had broken 2 inches off of one of her 8" horns, but I didn’t mind too much. 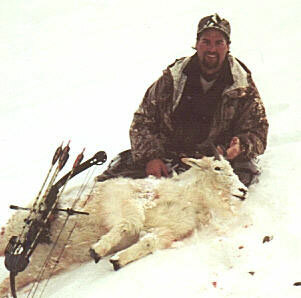 I had accomplished my lifelong dream of taking a Rocky Mountain goat and a Bighorn ram with a bow and had done it in one season. What a hunt! What a year! I would like to thank Pat Bergin for his help and companionship on both hunts. A thank you also goes to Mark Weidemann and Pat Sullivan for helping pack out my Bighorn. And a special thanks to my wife, Cody, and our son, Colton, for their undying love, support, and understanding. As I write this, I realize that I never did check the numbers on that Lotto ticket. Gotta go!